It’s summer! Yay! Time to relax, play and have tons of summer fun. It’s also time to enjoy some serious summer reading. I’ve rounded up some really fun ways to get the kids excited about reading. Browse the list and then add your favorite way to inspire reading in the comments. You might also want to learn how to help your little reader choose the right books and start a book wish list of your own! 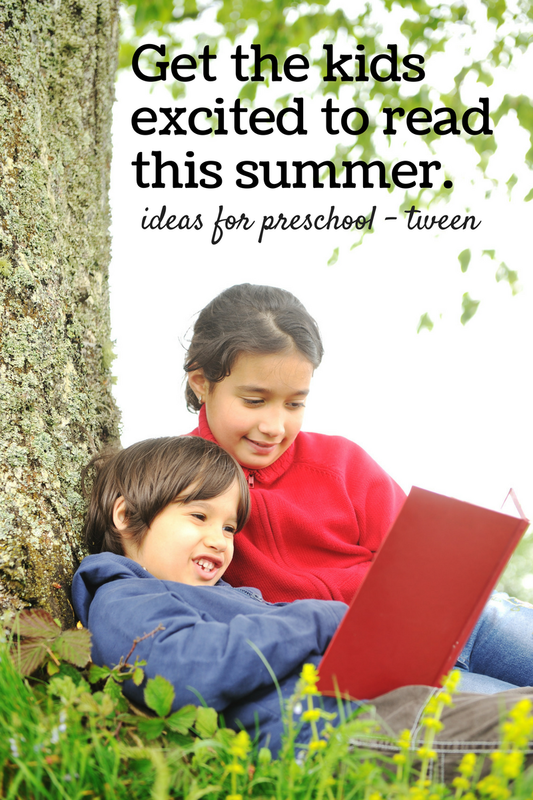 Most of these summer reading ideas will work for kids from preschool to tween. Pick your favorite or try a combination of two! I loved the idea of a Punch-card Bookmark (Over the Big Moon) so much that I decided to make my own. Our punch-cards are for reading, writing and math. No need to create your own though! Head over and print this one. Library visits are a great way to expand on your little one’s love of books. What Do We Do All Day has a great Library Scavenger Hunt that will help you introduce special parts of the library your kids might not be familiar with. Get your kids reading with you by starting a family book club! We did The Secret Garden and 20,000 Leagues Under the Sea. If you’re looking for a twist on summer reading fun, this is it! The 100 Places to Read Checklist (The Measured Mom) offers fun ideas of where reading can happen. Summer reading bingo?!?! How fun! I found two different versions. I was going to pick a favorite but I just couldn’t choose. Bingo Reading with Rewards Page (ABC Creative Learning) and Bingo Reading for Summer (The Chirping Moms). 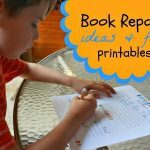 If you are looking for super simple this Printable Reading Log (Carrie Elle) is very cute! Keeping track of how many books you’ve read is very motivating. The summer reading bookworm (Chicken Babies) is so visual. I love that the kids will get to see their progress in such a fun way. More ways to get kids enjoying books this summer. These are affiliate links. Thanks for supporting A Mom with a Lesson Plan. Listening to books is one of my kids favorite things to do. We get a lot of audio books from the library but we also love Audible. You can try Audible and get two free audiobooks . Sometimes the best way to get kids reading is to add a screen. We love Epic! reading app for it’s great selection and low price. Children are very lazy reading! Thanks for your ways to get kids read books!